Jin (Jon Foo) a runner with a big fighting skill in the outside city of Anvil get discovered by Tekken the corporation who control the world they come after him and kill his mother Jun (Tamlyn Tomita). Setting out on revenge Jin goes to become the wild card entry in the iron fist competition against the Tekken elite fighters. To earn the wild card entry Jin meets Steve Fox (Luke Goss) an ex fighter who is hustling crowds to find someone to fight Marshall Law (Cung Le). After becoming victorious Jin is now the people’s choice and Steve becomes his agent/trainer taking him to the iron fist tournament. Heihachi Mishima (Cary Hiroyuki Tagawa) is the leader of Tekken with his son Kazuya (Ian Anthony Dale) the next in line and head of security. Jin’s goal is to take out the Tekken leader in revenge for his mothers death but first he has to beat the fighters. Can Jin over come the odds and become the first wild card Iron Fist winner ? This is based on the video game Tekken and from the few i have played i have only heard of a few of the fighters in the movies. 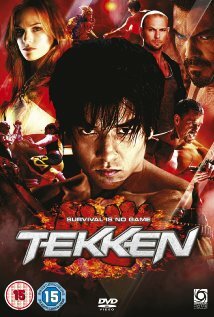 I think most Tekken fans will be disappointed with the film as many characters and twist do not follow the games very well. One the other hand having mainly human fighters it will make more sense to an unknown to the series. As a one of fighting movie this is not actually a bad movie with some well constructed fight scenes. The story is easy to follow seeing who the good and bad guys are but the twists are not as hidden as they could have been. All in all i think i would rate this movie well.